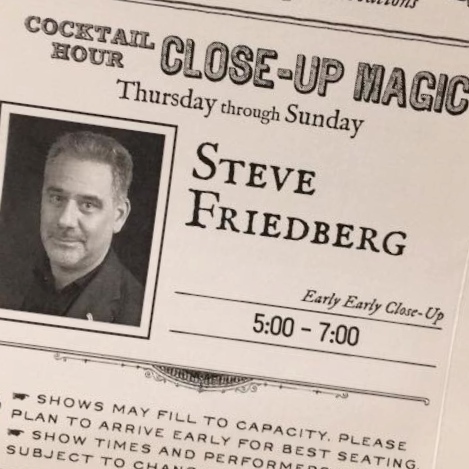 I was honored to be Steve's guest at the Magic Castle last night. After his close-up sets, we headed downstairs to the Hat n' Hair Pub, where Steve continued to draw crowds throughout the night. Watching Steve perform pieces for laymen (from his Forum lecture and notes) was a real treat. His storytelling approach is engaging, funny and beautifully interwoven with superb technique. Late in the evening (and still on Philadelphia time), Steve had a roomful. He engaged a woman whose attitude was a bit south of "good-natured." I might have shifted the focus to another spectator, but Steve took hold with the precision of a Judo master. He deftly used the weight of her skepticism and cockiness to his advantage. In no time, she was laughing and 100% astonished... as was the crowd. His ability to build rapport in that situation was remarkable and--for that lady--Steve created magic moments she will likely never forget! I also met Steve's wife, Mary. She is lovely--and quite the magic enthusiast. She clearly enjoys watching Steve fry his audiences. Once again, I must thank Rudy and the Forum members who keep this place going strong. Last evening was a delight and my good fortune to be Steve and Mary's guest traces back to one of the earliest Forum sessions. In a year's time, I have made many new friends here and learned so much! Um....wow. Just wow. Steve, thanks for the kind words.